You may be surprised to learn that invasive species rank second only to habitat destruction when it comes to the biggest threats to biodiversity. In the United States alone, there are an estimated 1,000 invasive species. 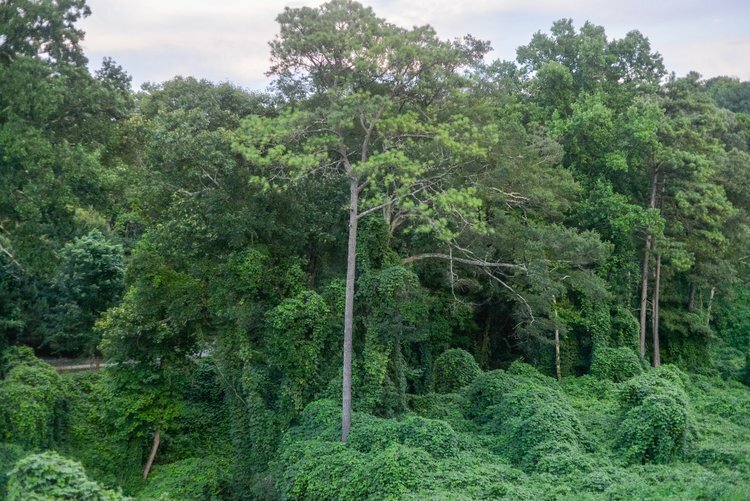 Some of these species, such as kudzu (pictured above), were brought in the U.S. deliberately, while other species, like the zebra mussel, arrived by accident. Regardless of how they arrive, invasive species can do a lot of ecological and economic damage. The overall economic cost of invasive species in the U.S. is estimated to be around US$ 120 billion per year. One of the more infamous examples is the zebra mussel, which frequently appears on lists of the worst invasive species. Back in 1988, the zebra mussel hitched a ride in the ballast water of a transatlantic freighter, arriving in Lake St. Clair—a freshwater lake located between Ontario and Michigan. The mussel quickly spread to other watersheds, such as the Great Lakes and the Hudson River, by riding the currents and hitching a ride on anchors, the bottom of boats, and other human-mediated modes of transport. Zebra mussels like to attach to stable objects. Stable objects can take the form of clams and other mussel species, which they can kill by reducing their ability to move, feed, and breed. This is how the zebra mussel wiped out certain species of clams in Lake St. Clair as well as other freshwater mussel species in Ireland. It’s estimated that at least 30 species of freshwater mussel are threatened with extinction because of the zebra mussel. Other stable objects to which zebra mussels like to attach include water-treatment-facility pipes and electricity-generation infrastructure. The mussels grow in thick densities, which can block pipes and clog water intakes. As a result, corporations in these industries spend a great deal of time and money monitoring and removing mussels from their infrastructure, and companies in the shipping industry must manage their ballast water to ensure that invasive species aren’t along for the ride. When it comes to invasive species, there are three basic strategies that corporations can adopt to manage the issue: prevention processes, early detection and rapid response, and restoration of native habitat. The best—and most cost-effective—way to manage invasive species is to prevent them from entering in the first place. Of course, that’s easier said than done. To accomplish this, a company will need to implement a systematic process that monitors for high-risk invaders at critical control points such as wooden packing material, horticultural plants, and ship ballast water, as we saw in the zebra mussel example above. While prevention is our first line of defense, no matter how many regulations or how much money we throw at preventing invasive species, some will continue to arrive. When they do arrive, we’ll want to have a second strategy in place to address this threat: early detection and rapid response (EDRR). The earlier we detect an invasive species, the better chance we have at eradicating before it before it multiplies and spreads, which translates into substantial costs and resources. Companies can participate in an EDRR system using their own staff, or by partnering with local universities, Native Plant Society organizations, and other trained experts to help with a baseline inventory and ongoing monitoring. For the “rapid response” piece of EDRR, our goal is to eradicate—or at least slow down—the invasive species after we spot it. In some cases, scientists will recommend that a newly introduced species be tolerated and monitored, as the cost of eradication may be too great, and some invasions will recede on their own. In other cases, it’s time to act by using a variety of mechanical, chemical, or biological control techniques. Each of these control techniques has a variety of pros and cons that go beyond the scope of this short post. The third strategy that corporations can take to combat the issue of invasive species is to restore habitat by removing invasive species and replacing them with native species. This may take the form of landscaping with native plants, planting meadows and gardens that are attractive to pollinators, and building wetlands or artificial ponds that provide water sources for local wildlife. For example, in Pacheco, Argentina, Volkswagen created an artificial lake near its facility to collect rainwater and provide a habitat for indigenous flora and fauna. This effort provides a natural landscape for the industrial center, and 62 species of birds have been counted at the lake. For many companies, the value proposition for these three strategies to combat invasive species will come in the form of ecosystem services and more intangible benefits in the forms of employee satisfaction and fostering goodwill with customers, regulators, and the local community. For other companies, the proactive implementation of programs to prevent, detect, and respond to invasive species can yield more tangible cost savings. Let’s take another look at the zebra mussel’s impact on water-treatment and electricity-generating facilities. In the United Kingdom, Thames Water spends £1 million a year on clearing zebra mussels from its raw water pipes and water-treatment facilities and applying heavy doses of chlorine to deter the mussels, while Anglian Water spends £500,000 a year tackling the problem. In the United States, zebra mussels are estimated to have cost municipalities and power companies over US$ 1.5 billion over the past 25 years. Another study came up with a cost estimate of US$ 267 million for all water-treatment and electricity-generating facilities from 1989 through 2004. These are big numbers. Any prevention, early detection, and rapid-response actions that corporations in those industries successfully implement can yield a significant return on investment. Coming attractions: In next week’s post, we’ll turn our attention to the biodiversity threats of pollution and climate change. In the meantime, don’t forget to make plans to attend the October 22, 2018 Half-Earth Day event in New York City – it’s going to be a great event! To learn more about Half-Earth Day, visit https://www.half-earthproject.org/half-earth-day.